If it seems like more of your paycheck is going to health care, it is. A national survey of workplace health plans shows costs are rising in Wisconsin and across the United States while worker salaries aren’t growing at the same pace. Middle-income families in Wisconsin spent 11 percent of their income on premiums and deductibles in 2017. Across the U.S., health insurance took up 12 percent of family incomes, according to data from the federal Medical Expenditure Panel Survey Insurance Component examined by the Commonwealth Fund. 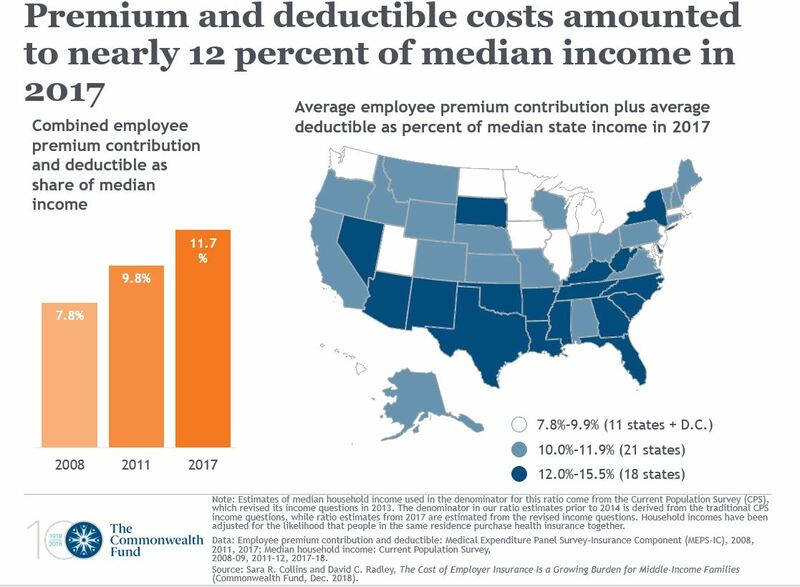 The Commonwealth Fund report found after modest price increases between 2011 and 2016, premiums for employer-based health plans rose sharply in 2017, climbing to more than $7,000 in eight states. In Wisconsin, workers paid about $6,400 a year in premiums — with the employer picking up most of the tab. The cost of health care has been one reason salaries have been relatively stagnant. But as workers get harder to find, that may change. Wisconsin’s unemployment rate is 3 percent. The U.S. rate is slightly higher, but still low. "That forces employers to think about increasing compensation and that may lead to a more generous compensation package," said Commonwealth Fund President David Blumenthal during a teleconference Thursday. On average, people with job-based insurance in the U.S. pay about one quarter of their overall premium cost. In Wisconsin it’s a little lower but some states pay a much larger share, the report says. Wisconsin is at the higher end for premiums individuals pay and lower than many other states when it comes to family coverage premiums. 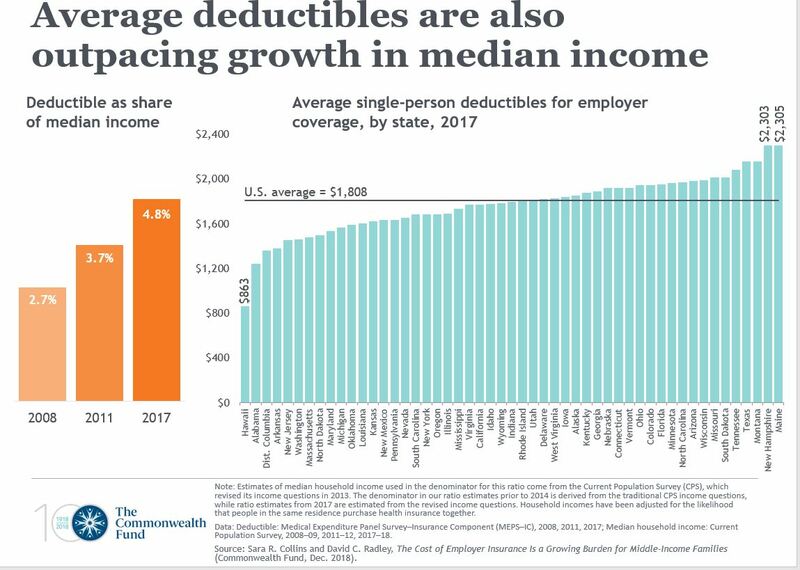 But deductibles in Wisconsin are higher than the national average. Even though health coverage is getting more expensive, the report says people aren’t getting higher quality insurance and some may skip care because the amount they have to spend out of pocket before insurance kicks in keeps rising. "Nearly 90 percent of employer health plans have a deductible that’s up significantly from a decade ago. So more employers are using them and they are larger than they used to be," explained Sara Collins, one of the report’s authors. Individuals paying 10 percent of their income for health coverage are eligible for Affordable Care Act subsidies. But middle-income families often make too much to qualify even though they are paying that much of their income or more for health care. The report shows the average family contribution exceeds that 10 percent in 22 states. One the report’s recommendations is for policymakers to make changes so more middle-income families could get subsidies under the ACA. Other suggestions include requiring employers to increase the number of medical services that are covered pre-deductible. And providing refundable tax credits to cover deductibles and other out-of-pocket costs.